Important note: Individuals earning their own money may be able to contribute their earnings, within limits, above the $15,000 limit. Please see ABLE to Work Blog published August 2018. One benefit of The ABLE Account is that it provides the opportunity for gainfully employed people with disabilities, who meet the qualifying requirements, to save and control their own money without fear of jeopardizing benefits. "Sean" was diagnosed with bi-polar disorder and other concerns in his late teens and has struggled with many issues over the years. One critical issue for him has been, and continues to be, money. He is able to work on a part-time basis, but usually does not work for an extended period of time. Working gives him a sense of purpose, but the fear of exceeding the $2,000 limit and losing his government benefits causes a great deal of anxiety. To maintain eligibility for monthly Supplemental Security Income (SSI), an individual cannot have more than $2000 of resources in his name. When he has had income, he often saved that money but if the balance crept up to the $2,000 limit, he would become very anxious and quit his job. His therapist wants to be sure that he continues to work and does not depend solely on government benefits since then he becomes hyper-focused on not earning any money. One option for Sean could be to fund a 1st party supplemental needs trust (SNT) and put his money in this account. But the expense involved in creating, managing and reporting for this trust account is substantial when compared to amount of money that will be in the account. In addition, money in the trust could not be used to pay for rent or utilities. Another option would be to make sure that Sean spent his money each month to stay below the $2,000 limit. The concept of “forced spending” simply does not make any sense. Spending money in order to reduce savings below the $2,000 limit is referred to as the “Spend Down Process”. Sean now has a thrid option: Since his diagnosis was made prior to age 26, he is eligible to open an ABLE account. He could then save his money in this account and use it as needed. Prior to the creation of the ABLE account, a Special Needs Trust and the “Spend Down” were the only options. Sean's earnings do not typically exceed $15,000(2018 limit); therefore technically he could save all of his earnings for future needs. Practically he will not be able to do so, but he will be able to set aside money for future needs just like every other person! Having the ABLE account could grant Sean some sense of relief, as well as the independence associated with managing his own savings and spending. The greatest benefit is that he may continue to work without fear of earning too much money. This is very important to his emotional well-being and self-worth. This month, Ohio became the first state to offer accounts made possible through the Achieving a Better Life Experience, or ABLE, Act with the launch of its program. 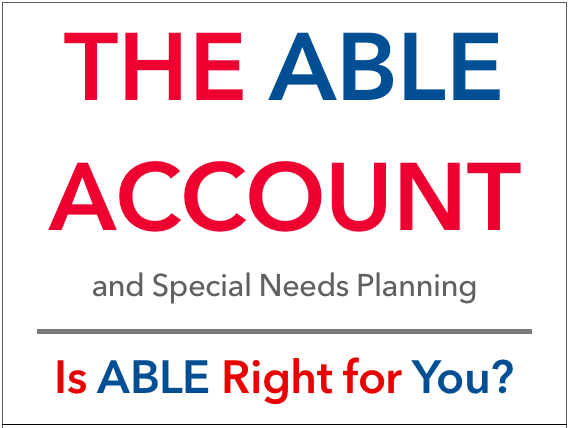 ABLE accounts are available to individuals with disabilities nationwide through the state’s offering known as STABLE. With ABLE accounts, people with disabilities can save up to $100,000 without negative implications on their Social Security Income benefit. To find out more about the STABLE account visit: http://www.stableaccount.com/. Last week, John Nadworny, representing the Massachusetts Down Syndrome Congress, attended a meeting of State Treasurers and representatives from the 6 New England states (MA, ME, VT, CN, RI, NH) to discuss the possibility of forming a consortium to offer the ABLE account to their constituents. This meeting was a first step toward crafting a platform for regional collaboration, as the New England states with smaller populations are concerned with achieving the critical mass necessary to effectively administer a program on their own. The consortium approach involves one state taking the lead and working together with the other states to develop a program that would provide meaningful benefits to the families in their state. At this point everything is still on the table; there may be a group of New England states joining together or some of the states may decide to partner with another program. However, one takeaway is that all of the parties involved are carefully analyzing options and being diligent in making sure that their constituents are being well served. One topic under discussion involves the ABLE or 529A accounts potentially being more transaction based, with account holders making deposits and withdrawals on a regular basis than traditional 529 plans, in which account holders save for a long term goal of a college education. This contrast in objectives may mean the ABLE account will be significantly more costly to administer than the 529 accounts. In attendance at the meeting was Christopher Rodriguez of the National Disability Institute (NDI), a non-profit organization dedicated to building a better economic future for individuals with disabilities and their families. 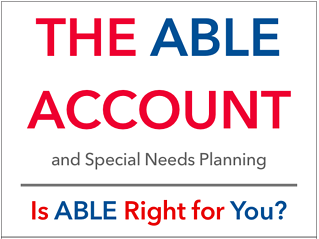 He introduced the group to the ABLE National Resource Center, http://ablenrc.org/, an excellent educational resource for families about the ABLE account. Currently negotiations are in process with financial institutions to implement a plan in Massachusetts. Stay tuned for future updates. We have received many questions, from both families and professionals, about how to incorporate the ABLE account into their planning. We sat down with John Nadworny to ask him these questions and share with you the answers. Here is the first in a series of blogs featuring answers from John to questions about how to use the ABLE Account. We will continue to publish information about the ABLE Account as it becomes available. Q: When will the ABLE account be available and how do I set it up? John: The US Treasury made a commitment to issue final regulations by June 30, 2015. At this time, it is uncertain as to whether that deadline will be met. Although some states have initiated offering the ABLE account, there may be future issues depending upon Federal regulations. 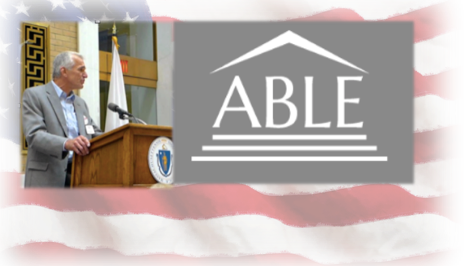 Massachusetts has formed a task force (of which John is a member), to craft implementation of the ABLE Account. Although it is difficult to give an exact date at this time, the task force estimates ABLE accounts to be available in early 2016. Q: The ABLE account sounds great but will using it effect my eligibility for government benefits? John: One of the main purposes of the ABLE account is to allow individuals with disabilities to save without jeopardizing their eligibility for government benefits. It is important to be aware that SSI eligibility is suspended if account exceeds $100,000. Although, Medicaid eligibility continues if account exceeds $100,000. Q: My son is about to turn 18 and he has a UTMA account with a balance of about $12,000 from gifts and other sources. Would an ABLE account work for him ? John: The ABLE Act allows the transfer from UTMA or UGMA accounts to an ABLE Account. At this point there are no limits on how much can be transferred from one of the above accounts to an ABLE Account. This is one of the most significant benefits of the plan. However, there are considerations when making this transfer. ABLE account contributions must be made in cash. Both the personal and tax consequences of liquidating the UTMA account holdings need to be considered when making this transfer. In this case, due to the relatively small amount, $12,000., the tax consequences will most probably not impact the ABLE being the right choice for these funds. If there are significant assets involved, a trust should always be considered as an option. The term significant is different for everyone, but a starting point may be $50,000 for many families. Again, every situation is different; therefore you should speak to a planner who specializes in Special Needs Planning or a qualified estate planning attorney. Q: I want to gift to all my grandchildren while I am alive. Can a grandparent give a gift to an ABLE account when gifting to grandchildren's 529 plan accounts? John: Like a 529 College Savings Plan, the annual limit that can be deposited into an ABLE Account will likely be $14,000 each year (based on 2015 limits). Although I have not seen this in the plan’s language, this amount will likely increase as it is tied to the amount that a person can annually gift for estate tax purposes. However, currently with a 529 College Savings Plan a person can deposit up to $70,000 in one year but not contribute any more over the next 5 years without filing a gift tax returns. This is a detail that will probably be worked into the plan as the US Treasury finalizes the regulations. When account balances exceed $100,000 there will be an offset for an individual’s SSI check. Also, although your grandchildren may have more than one 529 account, an individual may only have one ABLE account. Journalists may contact John directly via or by telephone 781-756-1804. The opinions voiced here are for general information only and not intended to provide specific advice or recommendations for any individual, nor intended as tax or legal advice. Prior to investing in an ABLE account, investors should consider whether the investor’s or designated beneficiary’s home state offers any state tax or other benefits available for investments in such state’s ABLE program. Consult with your tax adviser before investing.